I visited the Van Gogh museum in Amsterdam. I’m familiar with Van Gogh’s Starry Night, The Bedroom and Sunflowers. But seeing an entire collection of an artist’s work gave me a new perspective. His earlier paintings were extremely dark, like he painted in only blacks, browns, and blues. Look at this link for an example of how the light in his paintings changed over the years. Only after he visited Paris and studied the work of other artists did he start using bright colors in his paintings. A description of one early painting noted how his perspective of a chair was technically inaccurate. So he had crappy first drafts, too! I was thrilled to discover that a brilliant artist like Van Gogh practiced and struggled with his craft, just like we do as writers. Just as I’m sure all artists do. I couldn’t imagine having all my early short stories, standalone scenes or pathetic attempts at poetry on display for everyone to see. But it was so helpful for me as a writer to see another artist’s growth process. There was one section of still lifes -- the basic paintings of a vase of flowers on a table and maybe some fruit. This collection had a painting from a different artist in the middle -- I think it was Pissarro’s Still life with Peonies and Mock Orange. As an exercise, Van Gogh copied paintings he admired as practice to hone his craft and technique, to learn about light and shading. And in some cases, I liked Van Gogh’s pieces better. The concept wasn’t original - flowers in a vase on a table - but it was a completed piece of work in his early years. It was an accomplishment to him. It was practice to get him to Starry Night. So when I write another story about love, or finding yourself, or the basic clichés (although, aren’t most stories, on some level, about love?) I will allow myself those practice stories, those still lifes, the "flowers in a vase" version of creative writing. 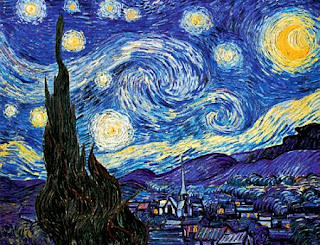 Starry Night is one of my favorites! I love this analogy. It's so hard sometimes to look back on some of our old work. Our "practice" pieces. But then we get to see the improvement in our current writing and it makes it so much easier to appreciate where we started and how far we've come. Hi Cindy, welcome to my blog! Glad you enjoyed the post. I am quite tempted to open up some of my earlier stories and see what I think of them now! It is a good analogy. Both of my parents are visual artists (you can see their work here), and we often talk about the similarities and differences between my writing and their painting, drawing, and sculpture. I thought it especially interesting to learn that Dad's process for doing drawings versus paintings parallels my process for doing short stories versus novels. If we have the inspiration and a big block of time, we can do a drawing/short story all at once. If we have, say, half an hour, we're more likely to put some work in on a painting/novel.